Hello! My name’s Eugénie. I’m a photographer from Portland, Ore., currently on the road in the great Northwest. I’ve just wrapped an artist’s residency at the Tofino Botanical Gardens, on the west coast of Vancouver Island, and am now heading to Alaska by way of British Columbia’s mainland and the Yukon. I’ll be checking out farm life along the way, traveling in my truck, and having deep conversations with Tilly, my pup and trusty co-pilot (shown above ignoring me, as usual). This is what I saw during the third leg of my trip, through the interior and northern British Columbia. Check back next week, where I’ll be showing the next installment of photos from my road trip here on Modern Farmer. And you can see every part of my journey here. 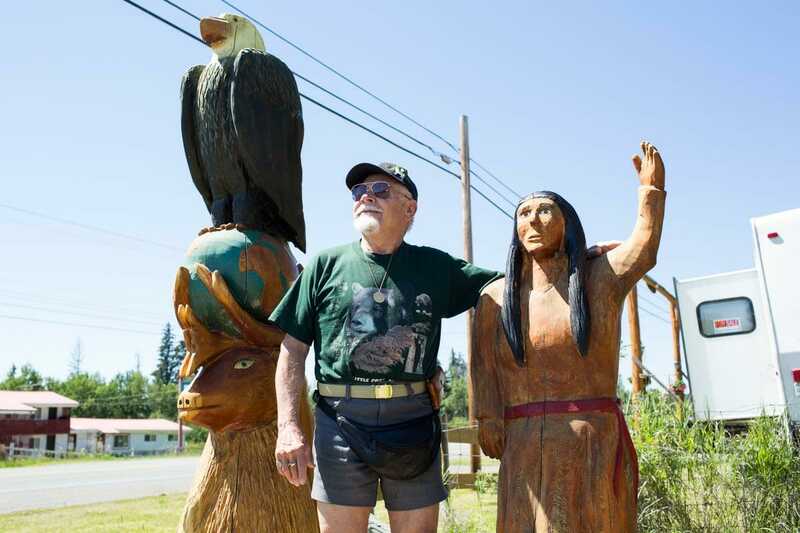 Turns out, fruit stands along the Cariboo Highway can attract some pretty interesting people. Lothar, for one. He’s 85, German, and a regular at the fruit stand in Lac La Hache. He told me a gripping story about nearly drowning while fishing in Alaska. I was hooked, and wanted to take him with me, to keep telling me stories, and to keep me awake, as this stretch of road is long. Lothar doesn’t join. It’s probably for the best. 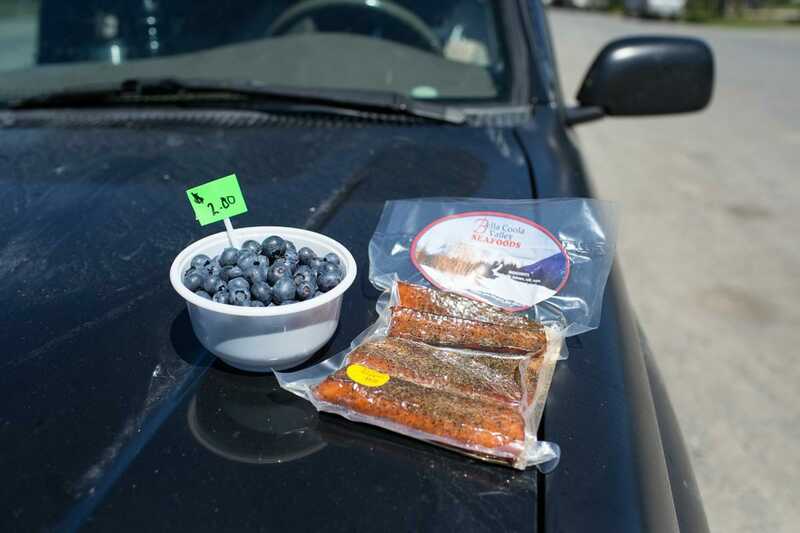 Instead, I stock up on some BC road food: blueberries from the Fraser River valley, smoked salmon from Bella Coola. Hours pass. Just when I think I’ll never see another farm again, I spot the driveway for Heritage Acres Organics. Matt Zeimer, what a nice man, is one of the very few organic farmers in the North Cariboo Valley (although his official certification is still pending). Berries are his trade, organic only. When he set out to farm about ten years ago, he didn’t see why he’d coat something with chemicals that was otherwise so healthy to eat. Makes sense. His niche is the edible blue honeysuckle, aka the honeyberry, sometimes called a haskap. It’s a Siberian, Russian or Japanese plant that stands up well in freezing temperatures and bears a small dark blue fruit that’s the shape of a chocolate covered raisin with the chalky skin of a blueberry. 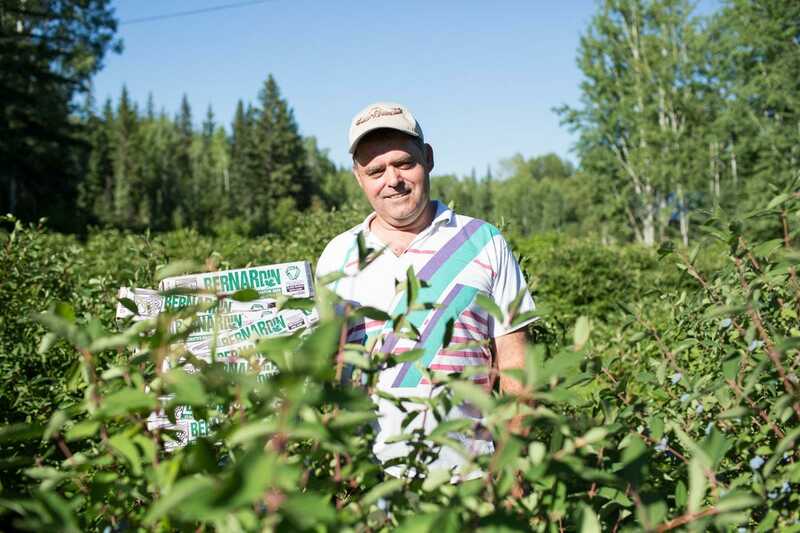 As they do in Siberia, the honeyberries thrive in Northern BC, and they’re selling well, too. With more antioxidants than blueberries, they are instead on par, healthwise, with the goji. I tasted a few. They were good, and apparently make a nice wine, to boot. At high noon the next day I roll up a dirt road to the Happy Pig Organic Farm in Telkwa, just outside of the larger town of Smithers. It being high noon in July, the purebred Berkshire pigs are too hot to emerge from the shade to say hello, but the turkeys have no problem. 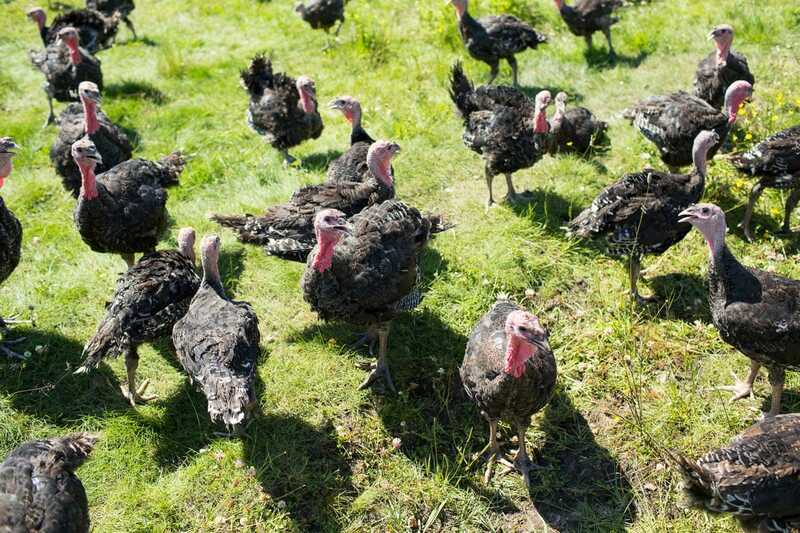 This is a really fun farm, bustling with pigs, turkeys, chickens, cattle, three dogs and a couple of alpacas, who are there to watch over the turkeys. Apparently alpacas are naturally drawn to birds, and when the local predators like a coyote or fox try to make a move, the alpacas effectively chase them off. I did not see this happen but it was nice to imagine. The owner, Marlene, an ex-forester turned deeply committed organic farmer, was enthusiastic and kind, and we chatted while taking a brisk walk around the farm. At the end of my visit, she suggested I stop in at Jonathan Knight’s place. It’s just up the road, she said. Just up the road turned out to be about two hours away, but I didn’t mind, as it was a breathtaking stretch. 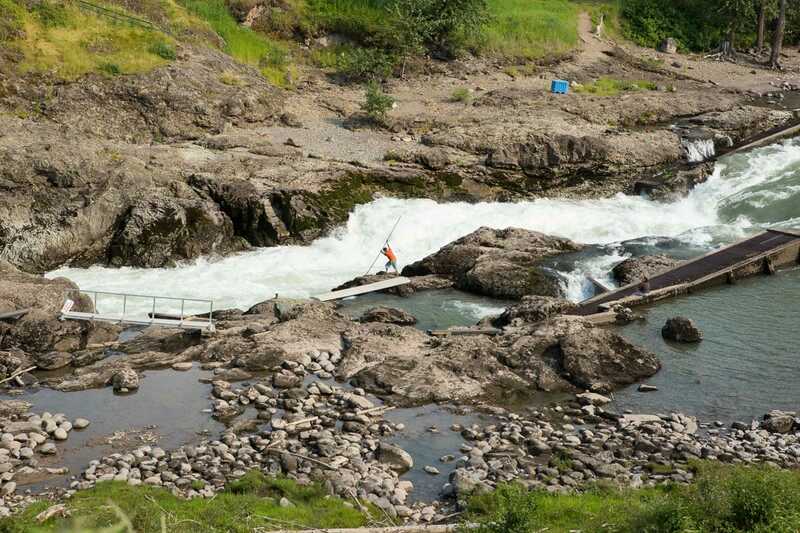 Breeze through Smithers, the main town in Bulkley Valley, and then you hit Moricetown, where just off the highway you can see local First Nations fishermen netting salmon in the canyon, as they have for thousands of years. This was cool, I pulled over for a while to watch. And then? Oh goodness. Maybe it was because it was evening by now, and the light was so nice. 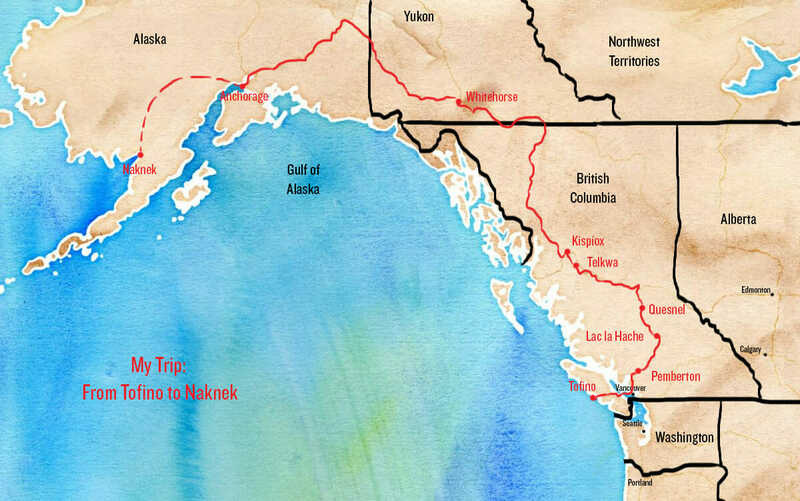 But this drive – passing New Hazelton, and then Old Hazelton, up the Kispiox River, and toward the Skeena Mountains — this was a detour of the finest sort. Wild country, with thick forests flanking dirt roads, and wide rivers to cross. I kept waiting for a bear to saunter out of the woods, or a cougar to launch onto the hood of the truck and snarl at us through the window. But no. Instead, I finally arrived at a most idyllic sight: a robin’s egg blue stucco farmhouse at the base of a field of blue green cabbage, greens, and grains. Where was I? 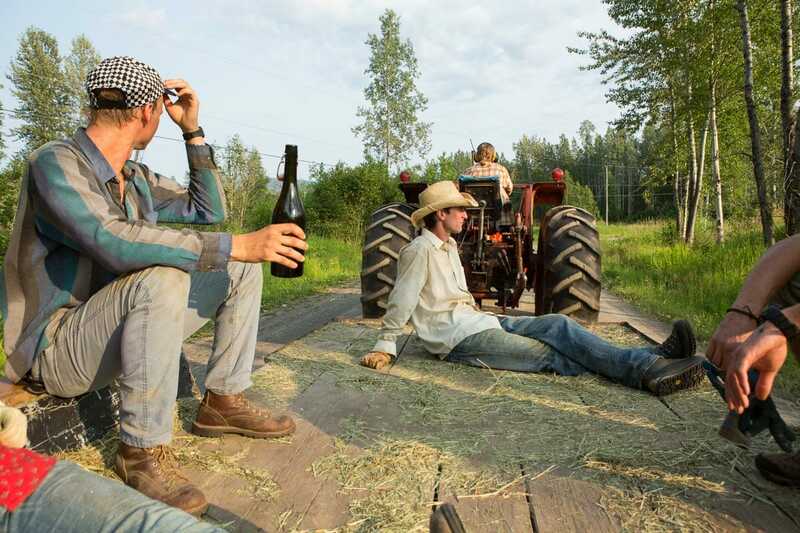 I heard voices and went around to the back of the house to find five young farmers, all about my age, sitting around a table drinking home-brewed beer. Welcome to the world of Jonathan Knight. Previously a baker by trade, he sold his successful True Grain bakery in Victoria to head for higher ground and try something new. 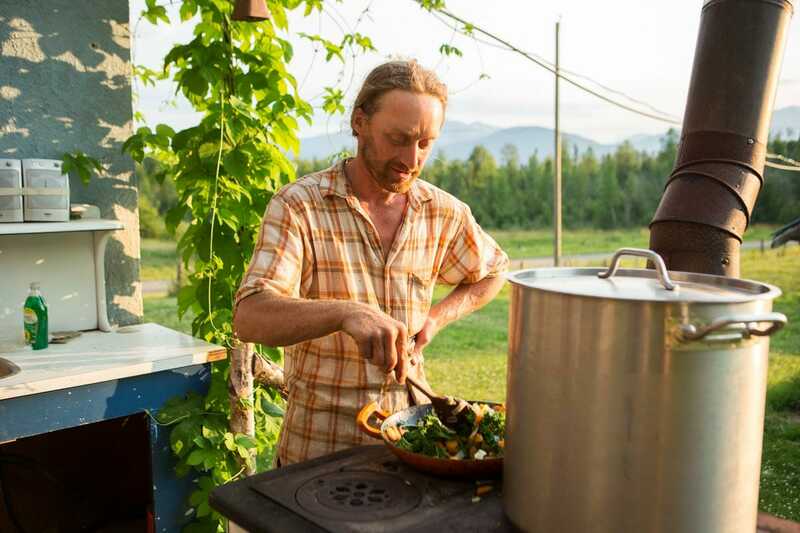 He grows and sells early-season market vegetables in an attempt to lighten his load by mid-summer and focus on other projects around the farm. When I arrived, he and his four volunteers were picking up the last few loads of baled hay. I tagged along, and collected each person’s story. Two WWOOFers from Victoria (Jonathan regularly hosts WWOOFers), one French cyclist who stopped by for a day, and ended up staying for a month (Jonathan also hosts touring cyclists through the Warm Showers program), and Scott, a ranger with BC Parks, just a friend. We all chip in as sous chefs as Jonathan cooks dinner outside, and as we talk about farm life he says something that strikes me. The next generation of farmers, he says, will be seeking out-of-the-way places to set up their farms. So they know what’ll happen to the land around their property. Which is to say, nothing will happen, ideally, as opposed to the encroachment of development and industrial farming that’s happened down south. 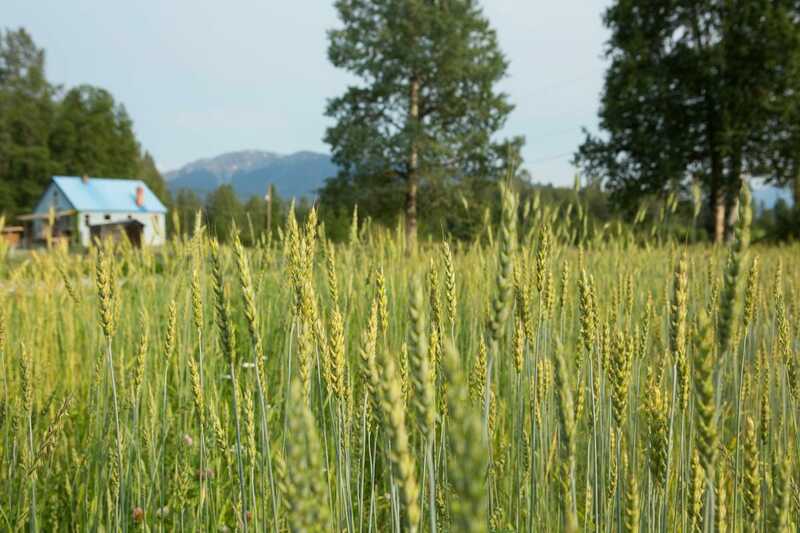 Who wants an organic farm that might someday have GMO wheat growing next door? I think about this. Is it true, that young farmers retreat to far off places? I survey the wild of where we’re sitting while we talk. It’s certainly what he’s done, and a life that’s working for him. I think about urban farmers, and wonder what he thinks too, but we don’t get there. It’s time to eat. 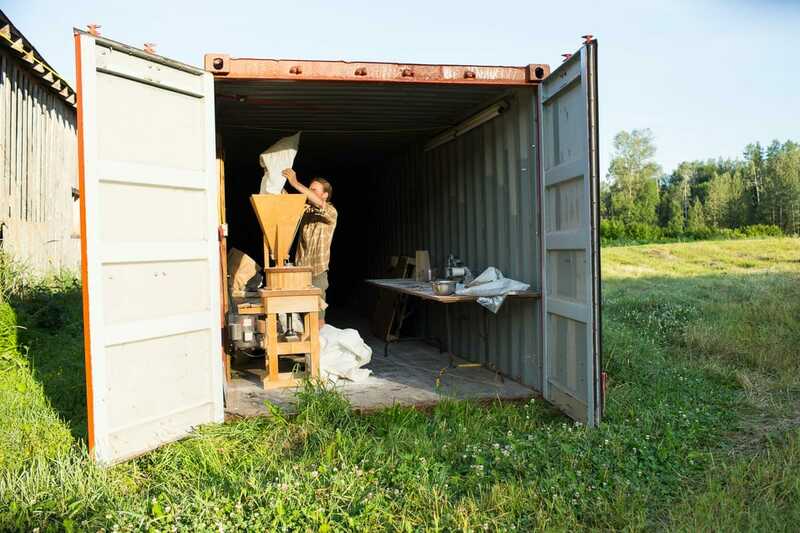 In the morning — yes, I stayed for the night — Jonathan takes me up to his mill, which he built himself, and stores in a shipping container as it’s the only thing that’ll keep out the critters. Eventually, he’ll be processing the grain he is growing on the farm. He’s got barley going already, and 40 different small test plots of heritage wheat. For now he mills heritage red fife that he gets from a friend in Saskatchewan, and will be on to his own grains once he’s decided which ones thrive out here. Seems like a lot of things thrive out here. The farm’s called Wood Grain Farm, by the way. It is a little slice of paradise. The light is always perfect, the wind never blows, the bugs hardly bite. It takes a long time to get here, but people get here, and then they stay. And I consider it, the staying. Just slide into the blue-green routine of the place and watch the rest of the summer pass by overhead. But I don’t. 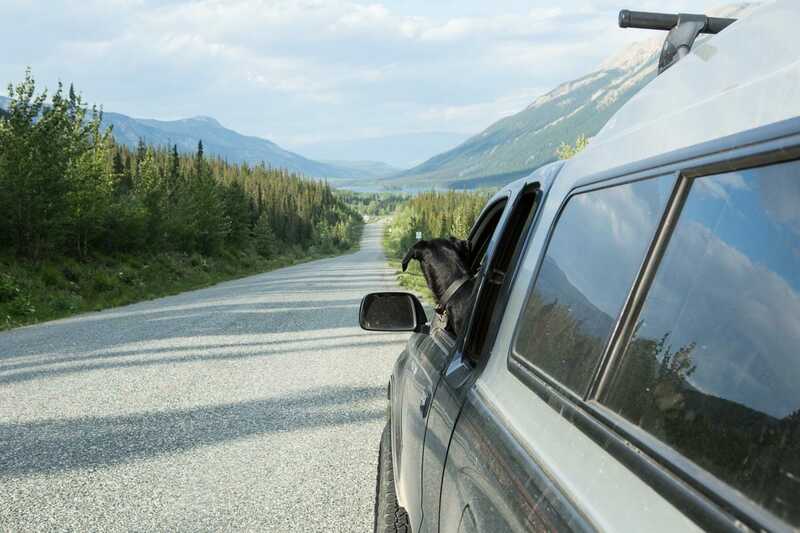 The Yukon is calling. Tilly reminds me of our mission, and points us north.